A view across a domestic garden with two women and maize growing in the background. Most Zande homesteads within the dispersed settlement pattern of this period (although rapidly changing) included adjacent gardens (ati) where some types of produce were grown as an integral part of the compound (kporo), with other fields located some distance away. 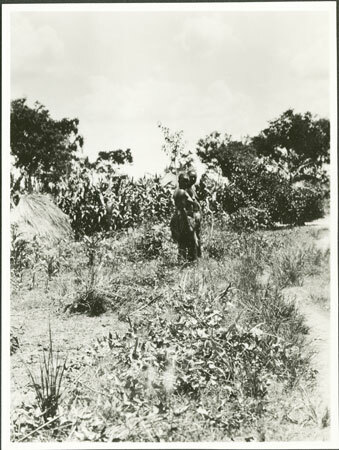 In The Zande Scheme (Northwestern University Press, Illinois 1966, page 73) Conrad Reising states that during his fieldwork in the early 1950s the Zande use of cultivations adjacent to the homestead was still evident, although increasingly disturbed by administrative policies. Morton, Chris. "A Zande garden " Southern Sudan Project (in development). 03 Jan. 2006. Pitt Rivers Museum. <http://southernsudan.prm.ox.ac.uk/details/1998.341.382.2/>.